Since my previous blog post about the home video release of The Peanuts Movie - due out Tuesday, March 8, 2016 - two further options have come to light. Meet the cast in the “The Voices of the Peanuts Movie” featurette, visit the Nickelodeon “Orange Carpet” to learn how an animated film is made with Owen Joyner from 100 Things to Do Before High School, and explains how to make cool stuff with 3 “Art of Dreaming Big” activities. You can order this version from the Target.com website for $22.99, or you can pick it up at your local Target store on March 8. It will not be available elsewhere. 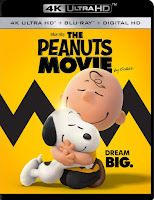 Second, The Peanuts Movie will be one of the first movies released in the new "Ultra HD Blu-ray" disc format. Ultra HD Blu-ray has four times the resolution (four times as many pixels) as current Blu-ray discs; this is commonly known as "4K." Of course, you need a new, Ultra HD Blu-ray player and a TV with 4K resolution to take advantage of this format - so probably it will appeal to a limited number of buyers. 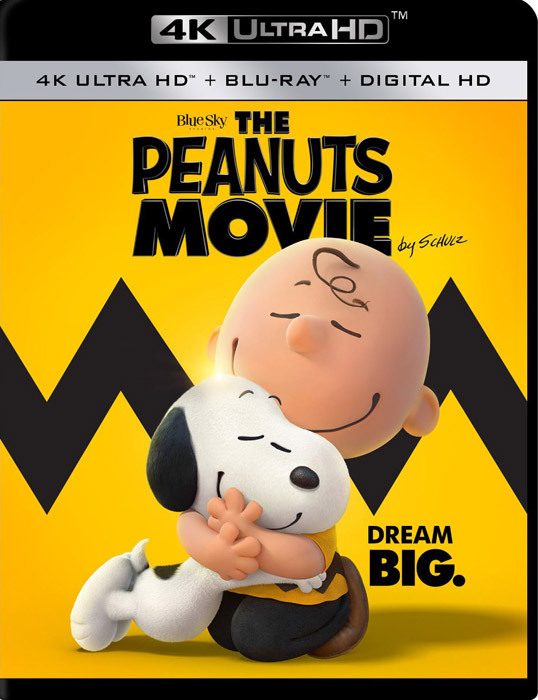 The Peanuts Movie Ultra HD Blu-ray combo pack includes the Ultra HD disc, a regular Blu-ray disc, and an HD digital download (but does not include a DVD). Presumably it includes the same bonus features as the regular Blu-ray, but no official list of features has been announced. The list price for this version will be $39.99, and it can be ordered from Amazon.com and other retailers. I like the Special Edition version, but I haven't seen it anywhere. Not at my Target, Walmarts, K-Mart, or Toys R Us. The regular edition gift set with plush should in theory be available everywhere, but I don't know how widely it is actually being stocked. It can be ordered online if nothing else. 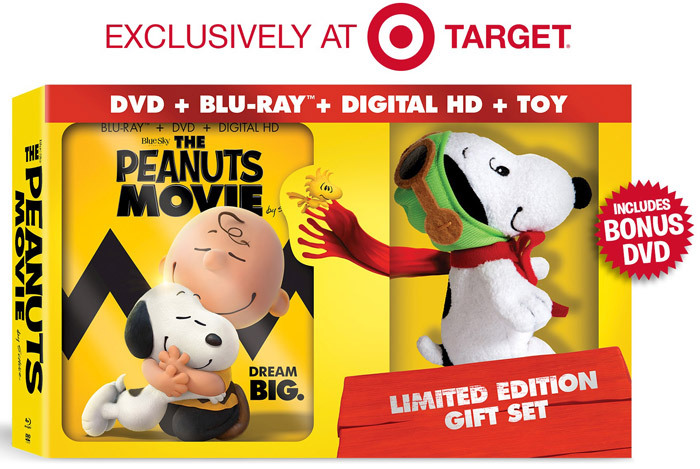 The version of the gift set with the extra disc described above can only be purchased from Target.